At Kyowa, we’ve leveraged 60+ years of manufacturing expertise to deliver consistently pure and efficacious products. Our quality-first approach ensures that our customers receive reliable, high-quality products that perform as promised. 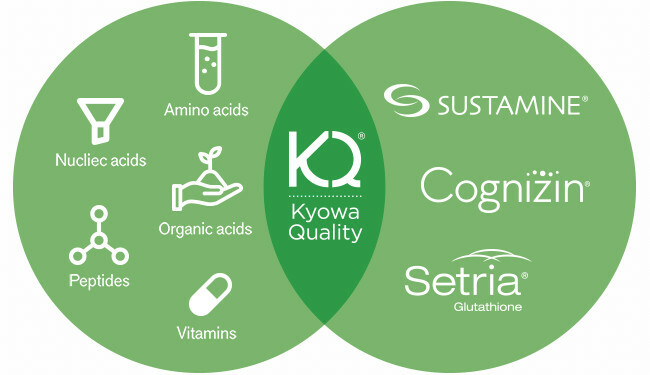 The Kyowa Quality (KQ) logo marks our extensive line of pure amino acids and related compounds that go far beyond mainstream commodities in quality assurance. The KQ logo is your guarantee of ingredients that are backed by our commitment to the highest standards. Kyowa's marketing support helps inform, educate and engage consumers for enhanced brand awareness. As a global leader in the research, manufacturing and purification of high-quality ingredients, Kyowa is dedicated to the creation of unique, health-promoting products that deliver proven benefits to consumers around the globe. Pioneers in the development and application of a patented fermentation technology used in the manufacturing of all Kyowa ingredients, many of our pure amino acids and related compounds have usage and IP patents as well. KQ ingredients are backed by Kyowa’s long-standing commitment to science that includes partnerships with top research facilities around the globe, as well as our on-site research and development staff. With the majority of our findings published in peer-reviewed journals over the years, Kyowa’s research and development staff continue to pursue new opportunities. Health claims for our products are based on decades of research that have been designed to substantiate the unique and specific health benefits of individual ingredients. World-Class Quality. Supported by Science. Kyowa Hakko is a world-class manufacturer of a wide range of amino acids and related compounds, vitamins and nucleic acids. We were established nearly 70 years ago, leading the way as inventors of the world’s first fermented L-Glutamic acid. As pioneers of amino-acid fermentation, we have always strived to find new ways to provide our partner brands with the best quality products in the world. Our patented science and processes mean we are a global leader in the development, manufacturing and marketing of ingredients for nutraceutical, pharmaceutical and food industry. 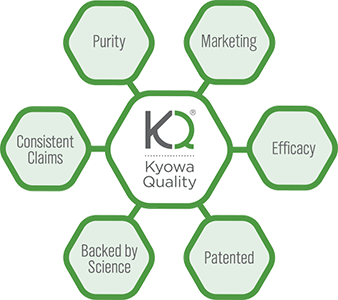 The Kyowa Quality logo is your guarantee that the ingredients are backed by our commitment to the highest standards. The Kyowa Quality logo assures customers that our pure line of unbranded amino acids are produced using the same sophisticated technologies and high-quality standards as our branded ingredients. Download our Kyowa Quality fermentation infographic for more information. For more details or to participate in our Kyowa Quality® program, please contact your Kyowa sales representative.